This design was the product of youth, stupidity, an embarrassing crash and a damaged sweater. I’m a young(ish) woman with POTS who must use a wheelchair outside my home. When the wheelchair became a part of my life, I entered my second toddlerhood. My motto is “I’ll do it myself.”—Well, at least until I can’t. One of my favorite things about my wheels is zipping down a long ramp. Once I get up some speed it is the closest I can come to the experience of running. At this point, I think you can see where the stupidity and the crash enter the story. I took off down a wonderful ramp and the bag holding my knitting flew off my lap. 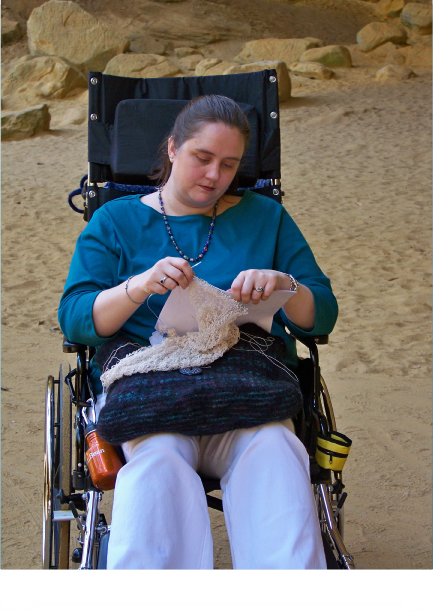 At that point my instincts were to save the knitting and forget about things like steering and braking, which are what my hands should have been doing at the time. I crashed into a wall and skidded about 20 feet with my right arm wedged against a guardrail. I wasn’t hurt and, the chair wasn’t damaged, but my just-off-the-needles sweater had an interesting new design element on the sleeve. This was unacceptable! I should not have to choose between works in progress and finished objects! So, Ramp was born—a beautiful trio of totes with handy (pun intended) hands-free panels for those of us who explore life on wheels. To use in hands-free mode, lay the bag on your lap, unbutton the panels and tuck the ends of the panels under your legs. Before making Ramp, I strongly advise that you find a copy of Fair Isle Sweaters Simplified, by Ann and Eugene Bourgeois, or visit the Philosopher’s Wool website and learn their Fair Isle technique. It’s an amazingly satisfying process and produces a fabric that is almost as lovely on the inside as it is on the outside. The Fair Isle charts come from 1000 Knitting Motifs by Luise Roberts. Finally the ceramic buttons are original designs of SummersStudioEtc and were custom made for these bags. 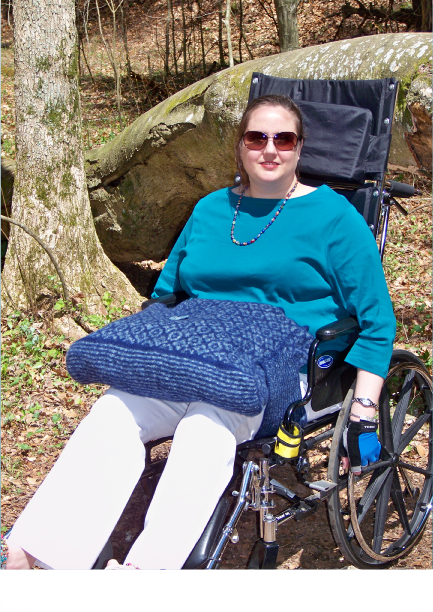 While Ramp was designed for wheelchair use, the hands-free panels make it ideal for other situations: knitting while sitting in bleachers, knitting while sailing, knitting on a rollercoaster, knitting on a ski-lift, knitting on a motorcycle, knitting—well, your imagination is the limit. 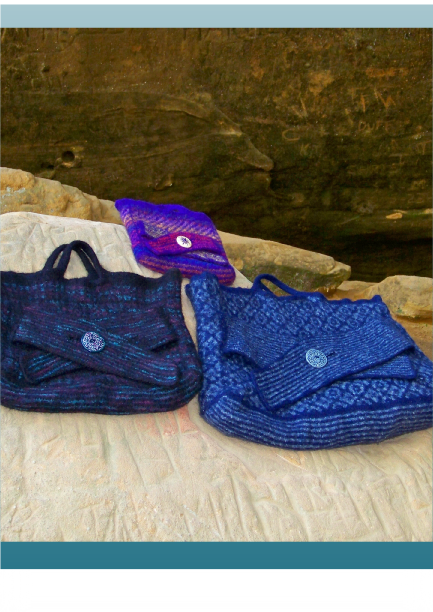 Ramp is a great laptop carrier, too—if you can bear to put aside your knitting.